Treatments Of Facial Wrinkles - Chicago Plastic Surgery Center, LLC | Stacie D. McClane, M.D. The gradual development of facial wrinkles, whether fine surface lines or deeper creases and folds, is the classic early sign of accumulated skin damage and inevitable aging. Premature aging and wrinkling of the skin may be accelerated by excessive exposure to the sun and other elements, overactive facial expression muscles, the frequent use of tobacco products, poor nutrition, or skin disorders. Fine surface wrinkles that progress to deeper creases, deepening facial expression due to repeated skin folding, and deep folds which develop with one's maturity are obvious changes which may combine to portray a less desirable appearance. Persistent facial lines, especially those involved in negative emotional expressions, may mistakenly portray to others, the look of worry, anger, anxiety, disgust or sadness, despite one's own positive internal feelings. Regardless of the cause of facial creases or folds, safe and successful treatments for reduction or elimination of these problems are now available with the help of a Facial Plastic Surgeon. Injecting or implanting substances which either temporarily weaken the muscles or act as skin volume fillers serve to soften or eliminate the appearance of wrinkles and produce a more youthful, rejuvenated appearance. Prominent forehead creases, brow furrows or eye lines (crow's feet) produced by specific facial expression muscles repeatedly creasing the skin may be effectively treated by reducing the function of specific facial muscles. Botulinum toxin ( Botox) is a sterile, purified protein produced from the bacteria, Clostridium botulinum, in the laboratory. Botox injected in small amounts into facial muscles binds to the nerve endings supplying the muscle and prevents nerve impulses from traveling to the muscle. When injected into muscle, it weakens or paralyzes the muscle around the area injected for a typical period of several months. The resultant weakening or paralyzing effect on the facial muscle temporarily reduces or eliminates previous skin creasing and new skin creasing is avoided. Botox may take several days to have its effect, and the effect typically lasts 3-6 months, in most individuals, before full muscle movement returns. At that point further treatment may be elected. Young, healthy-looking skin contains an abundance of a naturally hydrating substance called hyaluronic acid (HA). But as you age, sunlight and other factors can reduce the amount of HA in your skin. The lack of HA causes your skin to lose structure and volume, creating unwanted facial wrinkles and folds - like those parentheses lines around your nose and mouth. Using a dermal filler like Juvederm® or Restylane® is a safe and effective way to replace the HA your skin has lost, bringing back its volume and smoothing away facial wrinkles and folds. RADIESSE® works to add volume and lift needed to diminish the signs of aging - fine lines and wrinkles. What makes RADIESSE truly unique is the ability of the product to act as a scaffold under the skin, providing structure and stimulating your own natural collagen to grow. The product of natural collagen continues for several months, which extends beyond the initial effect of RADIESSE. Fat harvest & transfer creates a natural augmentation for the face, especially for the lips and mouth region. Fat is usually harvested from the abdomen and about one third of the volume remains after the treatment. Fat harvesting can be repeated for additional fullness. Expectations of any facial wrinkle therapy must be realistic. While an expectation for the complete and permanent removal of facial wrinkles for those persons considering treatment may be attractive, it is unrealistic, due to the ongoing nature of wrinkle formation and the currently available methods for treatment. The patterns and severity of facial wrinkle formation are highly individual. Therefore, after consultation with your surgeon, the appropriate therapy for your specific problems must be tailored to meet your needs. Management of many facial wrinkles may require repeated treatments or the use of combinations of treatments to achieve optimal results. The goal is to improve or reduce the appearance of the wrinkle or crease. This can be accomplished by reducing skin folding caused by underlying facial muscle action, as in botulinum toxin therapy. Alternatively, the skin beneath the wrinkle can be augmented to efface the wrinkle with injected or inserted filler material. The choice of a type of therapy depends on the location and extent of the wrinkles, the desired duration of the effects, and the tolerance for potential side effects. All of these treatments provide additional and complimentary aesthetic benefits when combined with another facial rejuvenation procedure such as facelift, browlift, blepharoplasty or skin resurfacing. In comparison to typical cosmetic surgical procedures, the office time for these procedures and the subsequent recovery period until one returns to normal function are minimal. Botulinum toxin therapy typically takes a few minutes to perform, and most patients may return immediately to home or work. Minor local irritation, redness, bruising, or swelling at the injection sites are the most commonly observed side effects, all of which typically abate within a few hours, but can easily be camouflaged with standard make-up if necessary. Likewise, collagen or human dermal injection therapy can be accomplished with a 5-15 minute procedure with similar attendant side effects. Some mild irritation at the injection sites is unavoidable but can easily be camouflaged with standard make-up, if necessary. 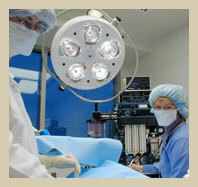 Insurance does not generally cover surgery that is purely for cosmetic reasons. Surgery to correct or improve facial scars or contour deformities resulting from injury may be covered. It is the patient's responsibility to check with the insurance carrier for information on the degree of coverage.